In my weekly column, we take a long look at impact fantasy football rookies. I compare their performance to date against my original expectations of them. 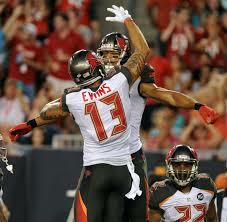 Let’s continue this 2014 version of the series by looking at one of the top rookie picks in Tampa Bay’s Mike Evans. You most likely spent a high rookie pick or a significant startup selection to get him on your roster. Here is what I saw in college from the receiver: For the first moment you see him, it is clear that Evans is a big bodied, powerful, striding wide receiver at 6′ 5″ 225 lbs. While he isn’t always a consistent hands catcher, the young wide out adjusts well to the ball in the air. Evans has the body control to reach behind for a pass thrown at his hip in stride. His concentration and athleticism make him a dangerous play maker. Evans gets separation with his speed and quickness with a few shoulder shakes tossed in. This receiver makes NFL gauntlet-like catches right at the sidelines: stops, spins around 180 degrees, and catches the ball without the corner realizing what had happened. He uses his big mitts, great vision, and large catch radius to pluck the pigskin at its highest point. Evans reminded Mayock and others of Tampa Bay wide out Vincent Jackson who knows how to use his body to make difficult catches and box out defenders (it was certainly ironic they now both play for the Buccaneers). The receiver ran a good 40 time at 4.53 for his size and plays physical down the field with the ability to out jump almost anyone. Despite all the pre-draft “Johnny Football” love, I am of the opinion that Evans made Johnny Manziel, not the other way around. Evans is a huge red zone threat and is a solid blocker who can help out on entire offense. This is what I saw from Evans against the Falcons: The opportunities were certainly there for the rookie as the game slipped further and further out of reach. Evans lined up in the slot, on the outside, and sometimes beside Vincent Jackson. The Bucs veteran quarterback, Josh McCown, was off-target for the majority of time he was on the field. The young receiver connected with him on a beautiful 36-yard bucket catch, tip-toeing right at the sidelines. On this play, Evans got off the line quickly, established quick separation, and showed tremendous concentration for the nice play downfield. His chances appeared to improve once second year signal caller, Mike Glennon, entered the game after a thumb injury sidelined McCown. Evans seemed to a run a more diverse route tree once Glennon started slinging the pigskin. On his crossing route, the wide out caught the ball in stride and did a great job shielding the ball from his corner back. He showed off somewhat of a nasty streak with good run blocking and a nice stiff-arm. There were a few passes that got away from Evans, or he would have had a much bigger night. On one of those plays, the rookie receiver got separation in the middle of the field, but the ball was a few inches too far for him to bring in. It would have been a spectacular catch between three defenders and then right off his fingertips. Evans had some issues with coming down on some contested throws, which makes me almost think of him as more of a finesse player. The sky appears to be the limit with him dynasty-wise, but I fear that his 2014 season will not be very fantasy relevant with his coaching staff and quarterback options. So if you are in a win-now mode, I would trade him for a more consistent fantasy option. If you are a team that is not in contention, I would try to acquire him now as this will be the lowest price you could ever get him.